This panini is easy to make and it can be made with a panini press or with just a frying pan. Enjoy! Preheat a panini grill machine. Core the tomatoes and slice the tomatoes and mozzarella 1/4-inch thick. Place the bread slices on a work surface. Spread each slice evenly with pesto. Sprinkle the tomato with salt. Place the remaining slices of bread, pesto side down, on top. Spread the top and bottom of each sandwich with softened butter. 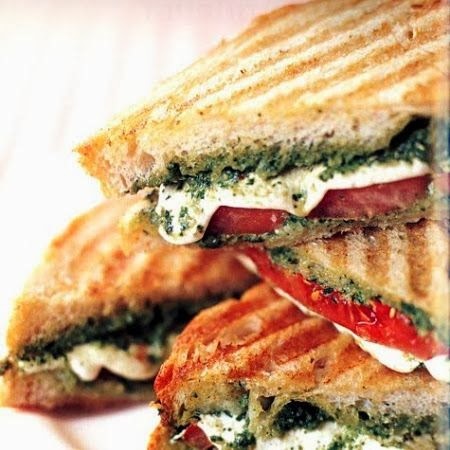 Grill the sandwiches in batches on the panini grill for 2 to 3 minutes, until the mozzarella starts to ooze. Cut each sandwich in half, and serve warm.